Queues for food and fuel return to Zimbabwe and so do violent crackdowns on protesters. Kate Adie introduces this and other stories from correspondents around the world. 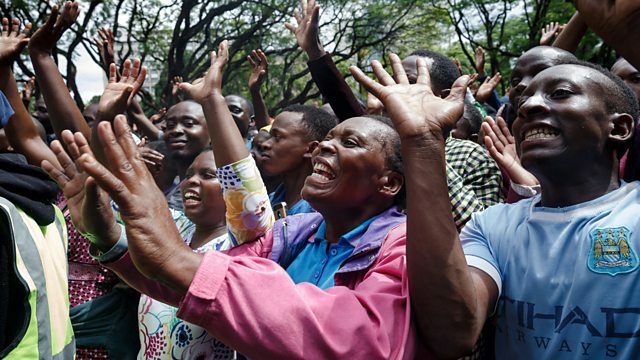 'My smile should tell you everything' one victim of an army rampage explains in Zimbabwe. In a society where you never know who’s listening, and who can be trusted, people smile to protect themselves, says Andrew Harding. Lyse Doucet is in Timbuktu where the threat of terrorism and a changing climate are making life harder for the people who live there and are deterring others from visiting the ancient, storied city. Krupa Padhy explores shifting family structures in Denmark where around 5% of babies are now born thanks to IVF. She meets solomurs - single women who’ve had IVF treatment, and diblings – children produced from the same sperm donor. Alexa Dvorson is in Iceland where an influx of tourists is making some locals angry - but not in the way you might expect. And Tom Colls spends an evening watching 'Integrity Idol' - a talent show for local government officials in Nepal.